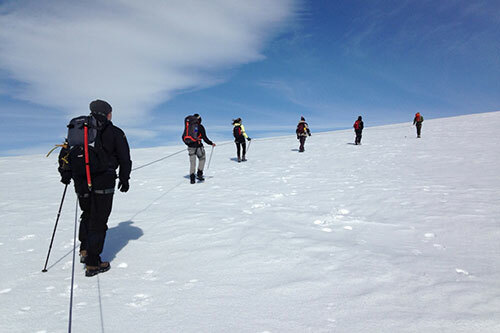 Cass Business School MBA students have completed the highly demanding physical challenge of climbing one of Iceland’s most spectacular glaciers, Mt. Eyjafjallajökull. This adventure was part of the Cass FTMBA Leadership Expedition and marked the end of this year’s client work in Rekjavik for MBA International Consulting Week in Iceland. This is the first time a Cass MBA cohort has attempted to tackle Eyjafjallajökull, which hides under its ice caps the volcano that brought Europe to a standstill in 2010. With a steep 12 hour ascent up the volcano to reach the top, the climb was no easy feat for the students. “We are incredibly proud of all those students who took part - it was a huge achievement. The feedback from them is that they have benefited both personally and professionally from this exciting, challenging and exclusive leadership development experience, gaining insights into the importance of timing, decision making and leadership skills". Over 50 MBA students volunteered for the challenge which was be led by Cass faculty members Dr Elena Novelli and Dr Santi Furnari. The hike put their teamwork to the test as groups were roped together for safety when crossing the glacier and ascending the 1,600 metre climb. "It's not just the consulting work we have to look forward to. I have been particularly excited to trek up Mt. Eyjafjallajökull - a rare opportunity to get access to an active volcano, which, since I studied Geography at undergrad, is something I have long wanted to do. It will be a great chance to improve our team working skills while enjoying the physical exertion." See the photos from the trip on the Cass Facebook page or read about our MBA programmes.